This black and white photograph shows Dr. Ebberly J. Leigh,(1860-1939), a physician from Hiawatha, KS, from the book entitled "Annals of Brown County, Kansas" by Grant W. Harrington. Leigh, a native of Highland, Kansas, graduated in 1884 with a medical degree from Rush Medical School in Chicago, Illinois. Upon graduation he returned to Kansas where he practiced alongside his father Dr. Jonathan Leigh in Hiawatha. For over fifty years Dr. Ebberly Leigh served as the physician for many of the pioneer families of Brown County. Actively involved in the community, Dr. Leigh held a life long membership in the fraternal organizations of the Masons and Independent Order of Odd Fellows. He also organized the fraternal organizations of the Oak Leaf Camp of the Modern Woodmen and the Life and Annuity Association. 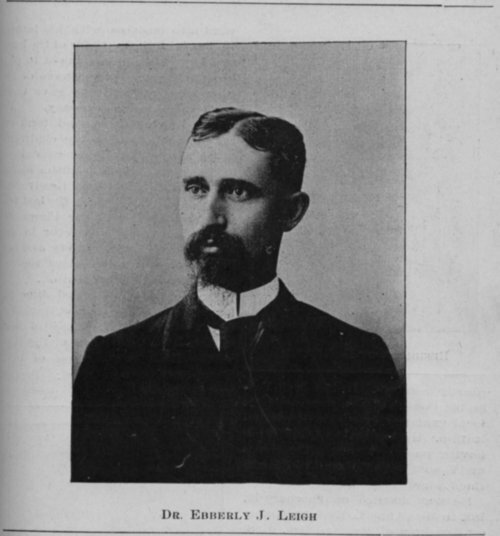 Dr. Ebberly Leigh's lifelong dedication to the Hiawatha community came to a close on February 18, 1939 when he died at the age of seventy-nine after a lengthy illness.